I'm sure you all know by now that Every Breath is a Sherlock Holmes re-imaging, of sorts. I mean the real Sherlock Holmes character by ACD exists in this world too, so it's not really a retelling but young James Mycroft is totally and completely an absolutely fantastic budding Sherlock in his own respect. And can I just say, it was freaking brilliant getting to know a young Sherlock?!! Don't get me wrong, Mycroft is a very unique take on the famous detective but at his core, he is so totally Sherlock, it's just sheer perfection! Already a forensics and amateur detective, he's simultaneously brilliant, tortured, cocky, vulnerable, charming and annoying. I loved every. last. bit. of. him. Every Breath isn't all about James Mycroft though. It's actually told from the perspective of Rachel Watts or 'Watts', which makes her a young, female version of John Watson. Straight away I knew that Watts would have no problem living up to her famous namesake. She's a beautiful mixture of toughness and sensitivity. She cares about people, you know? Sure she has the lady-balls to follow Mycroft around on this investigating, but she isn't made of steel. She gets freaked out sometimes, she gets overwhelmed but she doesn't go off running. She has her own backstory going on here and her voice was a wonderful way to tell the story, especially considering Watson does usually do the storytelling for Sherlock. 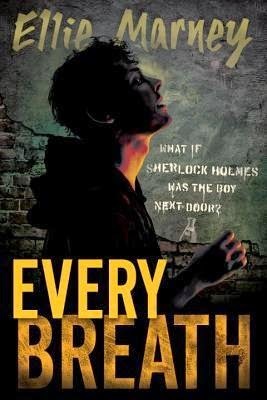 Every Breath isn't just a contemporary murder-mystery though. There's more. And by more, I mean there's also one of the swoon-iest romances I've come across in YA books in a LONG time. Given the inherent chemistry that Sherlock and Watson always have as characters, it's shouldn't be surprising I guess. Gods, this was such a wonderfully developed, slow burn romance. I just...I can't even. Chills. Electricity. Fireworks! And the best part? Watts remains true to herself during and after she realizes her feelings. She doesn't go all lovelorn or do anything stupid. Author Ellie Marney doesn't patronize the reader or waste any time with familiar YA-romance plot devices. This is a straight up, legit evolution in a romantic relationship. One that made me weak in the knees. Gah! It was soooo totally perfect. I want more. I need more! As soon as I finished Every Breath, I was pining for the sequel. Considering how contemporary isn't my usual genre, that says a lot! This was beautifully written and wonderfully imagined Sherlock Holmes re-imagining. Fans of the books, series and films should really check this one out, as should YA and adult contemporary readers. Seriously, I can not recommend this book enough! OMG, the timing of your review is so awesome because I was literally JUST rereading an online list of recommended Aussie reads that I'd bookmarked months ago- and Every Breath was on it! I'm so happy that you loved it! :D I'll definitely be giving this a read, and I hope that my library is quick about getting a copy! Lol, what is it about Aussie authors? They always seem to write the best books! I haven't heard about this one but now I'll be checking it out because I haven't read a mystery in a while. Also, the romance sounds lovely. This sounds SO good. I have it from netgalley and I'm so excited to read it! I know everyone has been loving it!! Wow, this sounds epic! I haven't even heard of it before. But what better way to recover from not enough Sherlock existing? Seriously, why hasn't there been more YA Sherlock? I don't know if the mystery or the romance you described sounds better. But, I'm so adding this book to my TBR pile. I'd heard of this before but I didn't realize it was a Sherlock Holmes retelling. I NEED TO GET MY HANDS ON THIS ASAP. I'm so excited, especially after your glowing review! The cover definitely caught my attention with its creepy vibe but I don't know if the overall premise is for me. To be honest, I wasn't sure either but man it hooked me and never let go! Sherlock Holmes!! Yes :) You got me with just that, Micheline :) Great review, and yet another book added to my TBR. So I had to come over here after reading your praise for this one in your End of Year Survey. I do not recall reading this review at all, so I guess it was in the midst of pre-Berlin preparation and stress. But I'm pleased to have read it now because heyyyy, I am TOTALLY on board with a young Sherlock character and a female Watson and a swoon romance between the two! I mean, it NEEDED to happen.